Oxon Hill, Maryland (CNN) - Dr. Benjamin Carson, the neurosurgeon who made headlines in February for making political statements during his address at the National Prayer Breakfast, said Saturday he was leaving medicine and pursuing other opportunities, which could include politics. Speaking at the Conservative Political Action Conference outside Washington, Carson said he was ending his medical career "while I'm on top," making the comparison to airplane pilots who retire before crashing. Carson will appear on Sunday's edition of "State of the Union with Candy Crowley" on CNN. "There are so many more things that can be done," Carson said, pointing to his educational foundation Carson's Scholars. Asked if he would consider entering politics, Carson said, "Once we get that taken care of, who knows." During his speech, Carson further fueled speculation that he'll run for elected office, asking hypothetically, "What if you magically put me in the White House?" Carson became a conservative favorite when he indirectly criticized tax policies and health care reform while President Obama sat just feet from him at the prayer breakfast. "When I pick up my Bible, you know what I see? I see the fairest individual in the universe, God, and he's given us a system. It's called tithe. Now we don't necessarily have to do 10%, but it's the principle," Carson said, adding that the progressive tax system is the "kind of thinking that has resulted in 602 banks in the Cayman Islands." "That money needs to be back here building our infrastructure and creating jobs," he said. 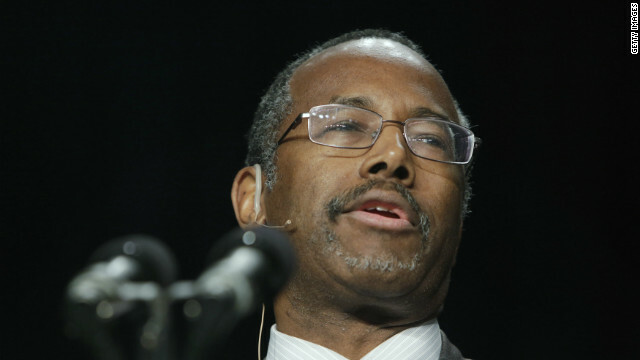 Carson, a renowned pediatric neurosurgeon, also lamented the idea of government-funded health insurance. During his speech at CPAC, Carson lamented that political watchers often dismiss the notion of Republicans who aren't white. "When did we reach a point where you had to have a certain philosophy because of your skin color," asked Carson, who is black. That money needs to be back here building our infrastructure and creating jobs," he said. and just where is all of his money?????? Another right wing one-trick pony who invokes the "will of God" as a rationalization for his socially and fiscally regressive political ideology and as a justification for his political aspirations. This is a doctor who must have seen a lot of families bankrupted because of the illness of an uninsured child, something that would not happen in any other civilized country in the world. What is he possibly thinking? One suspects that medicine will gain and politics lose by his decision to give up the former and indulge in the latter. I like how the good "journalists" of CNN didn't publish the most IMPORTANT portion of this man's speech today: OBAMA IS TRYING TO DESTROY OUR COUNTRY. This man gave an EXCELLENT speech today. But since he's black, educated, grew up poor & succeeded without progressives telling him he was a victim, YOU REFUSE TO REPORT HIS REAL BELIEFS. Not surprising. Just another reason why you are so far down the totem pole of viewership. I have been praying for someone to come along to help lead our country in better direction than it is heading right now. My prayers were answered! You have arrived ! We have hope for a better future. When I listened to you on CPAC today I was so proud and yes, can see you in the White House someday which was shared by the applause of your audience. GOD BLESS you. Way to go Dr. Ben. If only liberals weren't so racist to mandate that it has to be 'Black means Liberal'. So much for the 'open minded' who are really have minds that are locked shut tight. Wow, he says some earth shattering stuff. Okay, not really but at least he is a black man in the Republican Party. That must count for something eh? I AM SO IMPRESSED BY "DOCTOR BEN CARSON!" A very wise man and a christian! I hope he will run for PRESIDENT! America is in need of a man like this, so bad! Common sense, a brain, and a heart for America and it's people. CPAC=all the loonies in one bin. I remember this guy! Hopkins 24/7 in 2008! Medicine, reality TV, politics......not your average trip to the White House. I admire Dr. Carson as a brilliant Neurosurgeon but his speech was full of contradictions as a Republican. He said education is very important, yet his party wanted to get rid of Dept of Education and get rid of student loans and borrow money from your parents as Romney suggested. He criticized ACA but did not offer alternative. He said God is fair and to him the economy system is fair as it is, let the wide gap between rich and poor continue to widen. He talked about the Church being there to take care of the needy and so govt should back out, while many churches get grant from the governement to achieve this goal. He has already amde a lot of money from the health care so he can afford to "move" to other things to make policies that will hinder other people to achieve the level of success he acihieved. All the republicans that government should just get out of the way and let them make as much as they can and let the market forces take care of the problem. Yes govt. does not have all the answers but can really help. The GOP has not offer one single sensible alternative to the healthcare xcept to try and repeal the law. FYI I make high five figures and have health ins which has saved my life to detect early cancer and removed. Think of someone who does not hace ins. the cancer would have advanced by the time I see a doctor and just patch it up and wait to die. The ACA need to be reformed, no doubt but to repeal is not the answer, ihealth care should be a right not a priviledge because you never know when you will be sick and should be able to take care of small things before becoming too big to cure and eventually die from it. We can do better nad GOP has no answer. I have always admired Dr. Ben Carson. I have read all of his books. Ben Carson is worth listening too. He would be a great political leader and is a great neurosurgeon. If he chooses to leave medicine he will be missed greatly by the medical community; however, he will add much to our political community. Dr. Carson's idea that progressive taxes have led folks to open accounts in the Cayman Islands does not address the fact that those who do so are very, very wealthy. Those of us below the millionaire mark have to pay taxes because we could not afford to have accounts outside of this country. ...." the progressive tax system is the "kind of thinking that has resulted in 602 banks in the Cayman Islands" What sort of twisted thinking is that? With that sort of logic, no one would ever be convicted of a crime: "I had to rob the bank because of the progressive tax system....." or "I only stole the Toyota because I couldn't afford to buy a Mercedes!" There is no excuse for using tax shelters to avoid tax obligations on the income you earn! The point of a progressive tax is to help those who so much less that they spend nearly all of their income on the bare necessities, not luxury items. Those people stimulate the economy with practically every dollar they earn. What is the point of taxing 100% of a college student/part time worker who has NO discretionary funds. Don't even try to blame greed on the progressive tax. If you earn income, pay your fair share. If everyone wants a flat tax, then fine – but NO deductions, ZERO – no exceptions for mortgage interest, children, medical, nothing! THAT is the only flat tax. If you add one single deduction. It is not a flat tax. More deductions will be introduced over time until we're back where we started. Stop deceiving yourselves! A brilliant man who doesn't seem to grasp the fact that vulture capitalism is destroying most of our country. I am a married 38 year female. My husband and I have been married 14 years and have 2 children, 11 & 10 years old. I have never responded to someone to show my support. I grew up not watching the news or even having anything to do with politics. I knew nothing about politics. The last 3 years I have really learned a lot. I do want to say I am impressed with your beliefs. If you run for the White House I will not only support you I will promote your willingness to speak & stand up for our country. I am very excited to see someone with values and moral such as yours. Thank you for speaking and being a voice in the United States of America. MY COUNTRY that I love so MUCH!!! I SUPPORT YOU and your VALUES! A progressive tax system is necessary under a capitalist economic system. Otherwise, all of the income will be concentrated with only a few individuals, who will exercise an enslaving force against the rest. For capitalism to succeed, the economy requires capital, money, a free flow of capital. Yes, income at certain excessive levels should be confiscated by the government and recycled to maintain the flow of money. In the past , the government has recycled monies through education and jobs programs that would provide upward mobility for low income classes. My mom purchased his book 'Gifted Hands' when I applied to medical school 20 years ago. I deeply admired him until this moment. If I see that book again its going directly in the trash.